Known for their devotion to their families, the unique Dandie Dinmont Terrier is proof that good things come in small packages. Dandies are small and adorable with a personality to match. They are independent and intelligent and do great with kids and families. 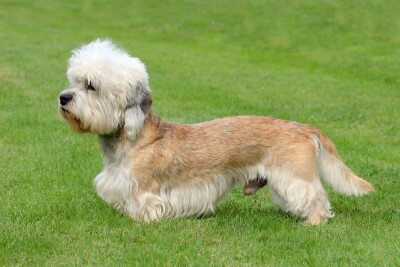 The Dandie Dinmont is an extremely rare breed of dog. That can be a good or bad thing. The good thing is that they are one of a kind and very unique looking, but the sad thing is that they are so rare that only a few people get to know their amazing charm and nature. In fact, if you owned a Dandie and decided to take him or her out on a walk, the chances of someone guessing what kind of dog you have is one in a million, maybe even two in a million. 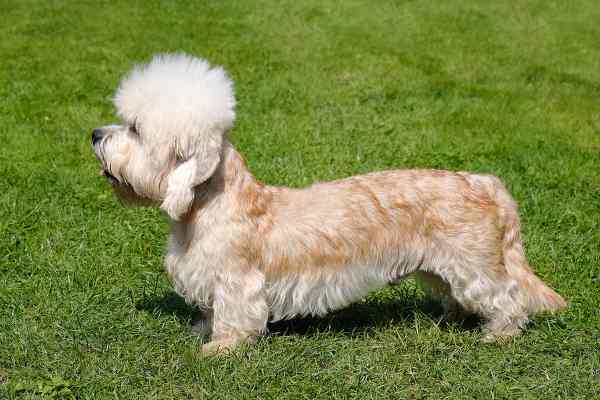 However, with that being said, if you know what a Dandie looks like, you will be able to spot one. Along with their unique name, they have a distinct look and cut. They have a large and round set of expressive eyes that can melt your heart. Their large head and broad, tapered skull with a deep muzzle is distinctive among all known dog breeds. They are as low to the ground as a water bottle, and weigh about as much as the average one-year-old human baby. It would take a stack of about three Dandies to reach the height of your average St Bernard, but the Dandie is actually not the world’s smallest dog. What they do lack in stature, they make up for in quiet confidence. The Dandie Dinmont Terrier has coined the nickname “The Gentleman of the Terrier World”. This could not be more accurate for this polite breed. If you or your family is in the market for a gentle, kind and loyal pup, that is very rare and unique, then look no further than the Dandie Dinmont Terrier. Coat Type: somewhat rough coat; a mixture of soft and hard hairs with a soft and silky topknot on the head. 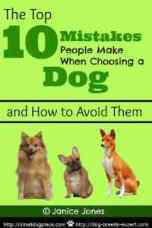 Good with Other Pets: They can get along with cats if they are raised with them, but due to their natural terrier instinct, they cannot be trusted with small pets such as bunnies, hamsters, gerbils, etc. The origins of the Dandie Dinmont Terrier date back to the 1700s, and they were bred on the English-Scottish border to hunt vermin. 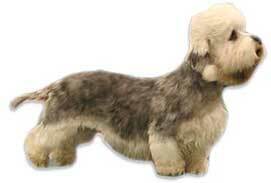 Their ancestry is a mix of terrier including Bedlington, Scott, English, and Otterhound. They arrived in America in the late 1800s and the breed was registered with both the American Kennel Club (AKC), as well as the United Kennel Club (UKC). During the Second World War, these kennels were dispersed and the breed nearly went extinct, like many breeds during the war. After the war was over, kennels and breeders worked to raise the number of Dandies, but to this day, they still have very few numbers compared to some of the more popular breeds of small dogs. They only have a fraction of dogs registered to AKC compared with other small breed dogs such as the Shih Tzu, Poodle, or Boston terrier. In 2013, the Dandie ranked 168th out of 177 breeds with the AKC, although this is a slight comeback from previous years. As for the unique name, Dandie Dinmont, it was actually named after a character in a fictional book. This makes the Dandie the only breed to have a fictional namesake. Their name is a novel concept and Dandie Dinmont was the name of a fictional character in an 1814 Sir Walter Scott novel called, Guy Mannering. The character Dandie Dinmont was apparently a jolly farmer who keeps a pack of interesting pepper and mustard terriers. As the novel’s popularity grew, the name Dandie Dinmont Terrier was coined. This is a breed loved by many people including King Louis of France and Queen Victoria. They loved Dandies and owned a few. 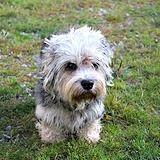 Bill Cosby has also had the chance to experience the uniqueness of a Dandie. The Dandie Dinmont Terrier is a very confident dog. It is also intelligent and independent. This means that training can be a little more difficult. They are very trainable, but they need a firm hand for training. Firm and consistent training will be the key to a well-trained Dandie. It is important to know that this particular breed of dog is probably the calmest of all the Terriers; however, they do have some terrier-like personality traits. They make great watchdogs because they are alert and intelligent, but after they get your attention, it is important to let them know they can calm down and stop barking. This breed has the tendency to develop Small Dog Syndrome, which can be the result of inconsistent and careless training. With SDS, the dog can think that they are the kings of the castle and that they are the owner and pack leader. This can lead to all sorts of behavioral problems such as separation anxiety, stubbornness, difficulty training, and more. These are not typical behaviors of the Dandie, which is why a firm and confident hand in training is as important as it is. Positive and motivational training works best with these dogs and yelling or hitting is definitely not the way to go with them. Early socialization is also important with this breed if you have small children or cats. Being raised with small children and cats around will make them less likely to act out around them. Being raised with cats is okay, but since they are terriers that were bred to hunt, keeping rodents and other small animals such as hamsters are not a good idea with this breed. They might try to run and hunt while on their daily walk which is another thing to keep in mind. Don’t let this scare you because they are a very calm and docile breed, hunting is in their blood and that is something that cannot be changed. Dandies are suitable for apartment living because of their size, but they need daily walks and can sometimes be a little vocal. Dandie Dinmont Terriers have a Baritone bark, which can make them seem much bigger than they actually are. They love to run around and go on walks, which is required to keep them healthy. They are overall somewhat active, but nowhere near that of a frantic terrier. 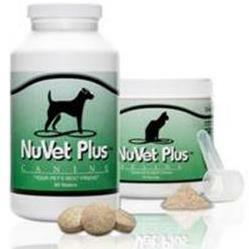 This also means that they are not as hyperactive as some small dogs and have a lower activity level than some. They still need their daily walks and exercise. They will do fine with a couple walks per day and a small amount of vigorous exercise indoors or out. Dandies are loyal to their families and bond strongly with them. It is unusual for your Dandie to be cautious and not as inviting to strangers. Overall, Dandies are amazing small dogs who are smart, loving, and loyal. They are not as hyper and high-strung as most terriers, but they do have typical terrier traits such as independence, willingness, and courage. This is not a breed that can go without a daily brushing. They have a mixture of soft and hard hairs with a soft and silky topknot on their head. Experts say there is no such thing as a “hypoallergenic” dog, but nevertheless, this breed does not shed, which would make them great for families or people that suffer with pet related allergies. Even though the Dandie Dinmont Terrier does not shed, they still need regular brushing and professional grooming twice a year to maintain their beautiful coat, and show dogs require expert grooming. This is not the cheapest breed when it comes to grooming, but they have a very smooth and beautiful coat if it is taken care of and maintained properly. Other than regular brushes and baths, it’s important to check their eyes, ears, and nails occasionally to make sure your dog is overall healthy. Last, but certainly not least, the Dandie, as all breeds needs frequently teeth brushing to maintain those pearly whites. This is a fairly healthy breed, but they do have a few health problems. They can have eye and back problems and can suffer from epilepsy. Hypothyroidism is often common in older dogs. It is also important to do a little portion control when feeding your Dandie, as they can be prone to obesity. The average weight of the Dandie Dinmont Terrier is between 18 and 24 pounds. Since they are so close to the ground, it could cause some back problems if they become too overweight. Spinal Disk Herniation: This is also called a slipped disk and is common in breeds such the Dandie who have long backs. Trauma is usually the cause in canines with long backs. Glaucoma: A disease that affects the optic nerve leading to a lower field of vision and blindness.